This Ale was created in Collaboration with Sierra Nevada Brewing Company and the Trappist-Cistercian Monks at Abbey of New Clairvaux both in California. The brewery is located in Chico while the abbey is located in Vina. The monks may be trappist Monks but this is not an official Trappist beer but an Abby Ale. 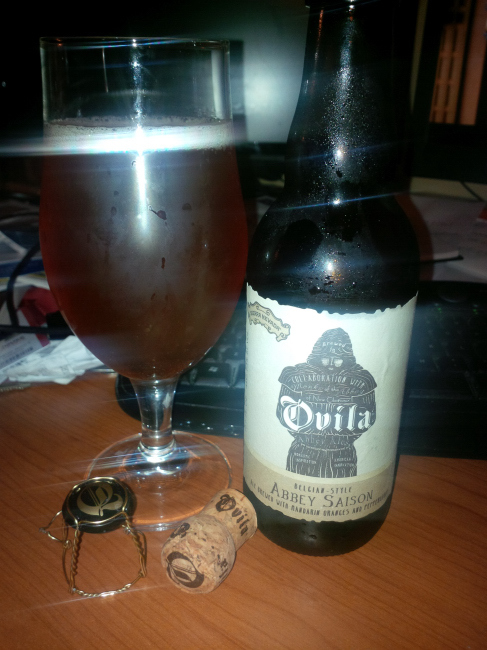 The “Ovila® Abbey Saison with Mandarin Oranges and Peppercorns” is what has been born out of this collaboration. This interesting saison pours an amber/orange with a quickly dissipating off white head. The aroma consists of peppercorn, mandarin oranges, lemon, yeast and wheat. The flavour is of lemon, mandarin oranges, peppercorn, yeast, wheat and some hops bitterness at the finish. This body has a very nice mouth feel and body. The alcohol content comes in at a respectable 7.5% alcohol and IBU of 24. This is a highly tasty beer and I really hope that the monks start to look into becoming an official Trappist brewery to shine a light on this very special project they have with Sierra Nevada Brewing Company. Commercial Description: An homage to the monks’ noble work, this unique farmhouse ale is incredibly complex with notes of lemon, pepper, straw and herbs balanced by the tang of Mandarin oranges and a spicy kick of pepper. The Mandarin oranges used to make this beer were locally grown, including a portion grown on the grounds of the Abbey of New Clairvaux and picked by hand by the community of monks living there. We hope you enjoy this collaboration ale. Food Pairing as per the Sierra Nevada Brewing: Curried dishes, poultry, fish, shellfish, Camembert, Parmesan, Gorgonzola, orange sorbet, crepes. This entry was posted in Imperial, Saison and tagged Abbey of New Clairvaux, bitter, bitterness, california, chico, cistercian, collaboration, hops, hopy, lemon, mandarin orange, mandarin oranges, orange, oranges, pepper, peppercorn, sierra nevada brewing company, some hops, trappist, vina, wheat, yeast.